Grumman OV-1 Mohawk, Lycoming T-53 Fuel Vaporizer. P/N 1-130-590-02. Condition, as removed. Sold for display only, as is, no returns. 3 1/8" OV-1 Mohawk Glideslope Indicator. Manufactured by ARC. Model ID-453/ARN-30. Also used on UH-1 Hueys, CH-47 Chinook, T-33 Shooting Star and many many other warbirds! Very clean item. It would make an excellent show item of the office or home or as a mock up panel instrument. 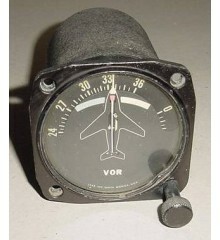 3 1/8" OV-1 Mohawk Glideslope Indicator. Manufactured by ARC. Model ID-453/ARN-30. Also used on UH-1 Hueys, CH-47 Chinook, T-33 Shooting Star and many many other warbirds! Very clean item. It would make an excellent show item of the office or home or as a mock up panel instru..